Art is for the Spirit is the latest exhibit at the Mori Art Museum. Unfortunately, it ends today. If you were lucky enough to catch the show, you enjoyed one of the best collections of modern art, from the UBS Art Collection, organized in an intelligently coherent way. I liked the three themes of “Body”, “Built World”, and “Space”, roughly corresponding to portraits, the built environment, and nature. The title piece, by Jonathan Borofsky, exemplifies the aim of the exhibit which is to show the connection between art and life. 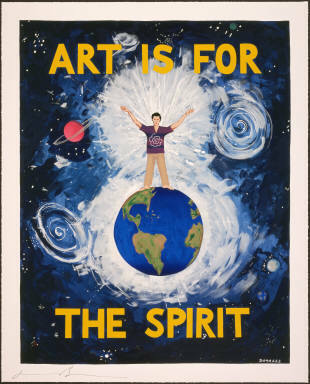 Borofsky also wanted to convey that art isn’t for money, that the primary reason we do art is to feed the soul. There is irony in all of this of course since the original artwork is worth lots of money, a print will cost you $6,000, it belongs to a collection owned by a very large Swiss bank, and it is displayed in a museum owned by one of the richest men in Japan. You also have to pay 1,500 yen to look at it. Fortunately, T was able to score us tickets through her nefarious connections in the banking world. The sample of the collection shown at the Mori is star-studded with celebrity artists ranging from the venerable Roy Lichtenstein and the iconic Andy Warhol to the latest hot artists like the provocative Damien Hirst and the imaginative narcissist, Cindy Sherman, who’s entire body of work consists of self-portraits. The exhibit is pretty European and North American heavy, but being shown in Tokyo, there was an attempt to introduce Japanese and other Asian artists, as well as artists from Latin America. Among these, in Qin Ga’s Miniature Long March, the artist retraces Mao’s Long March and has a map of the journey tattoo’d on his back. That’s commitment to your art! My favorite pieces were by the Columbian artist, Oscar Munoz. His works addresses the political instability and danger of living in his country. In one work, Project for a Memorial, four screens show his hand drawing portraits, one by one, with a brush using only water on pavement. Even as he sketches the face, it begins to evaporate, showing how transitory a life is, disappearing as soon as it comes into being. 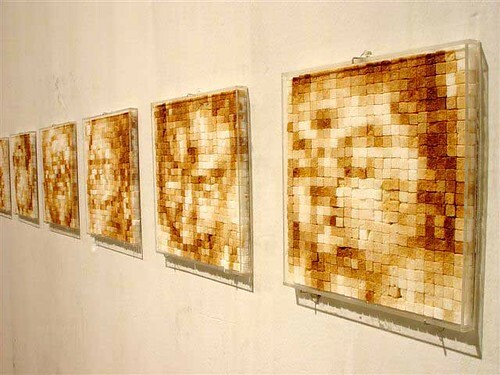 In Pixels, portraits of slain men from police photos, casualties of the drug war, are made from sugar cubes stained with coffee, resembling pixels from a digital sepia photograph. Sugar and coffee: Columbia’s two biggest legal exports. Such an imaginative use of symbolic everyday materials was a masterful way to convey the economic impact of those industries on his subjects. It’s hard to see the faces on this photograph from this angle. Try looking from further away. The Mori Art Museum, located at the top of Roppongi Hills, is one of the more expensive museums in Tokyo. But the cost includes a free audio guide in English, which I found extremely informative, and access to the Tokyo City View observation deck. The 360 degree panorama is completely unobstructed by other tall buildings. Also unlike other museums, which usually close around 5pm, the Mori closes at 10pm, except on Tuesdays. So you can go there after work, take your time perusing the art, and then stroll along the big windows enjoying the night view. T and I sipped wine at the bar while looking over the city, trying to locate Tokyo landmarks. We were able to identify our apartment building and our work places, tiny smudges of shapes and light. The entirety of our daily lives were laid before us like a distant memory, the casual sketch of our efforts evaporating into the glittering night. Pixels and Project for a Memorial are both so thought provoking and inspiring. Wind, your posts offer such a window into the world of art. that’s high praise from a great artist and lover of beauty.